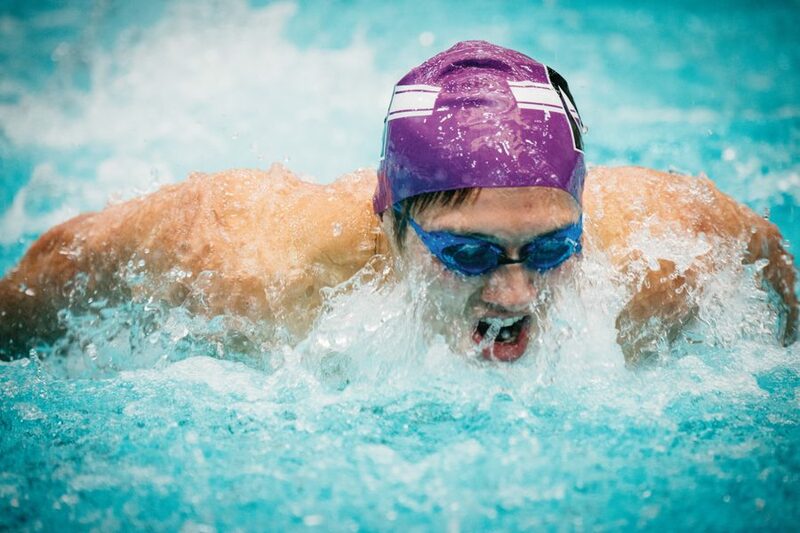 A Northwestern swimmer takes a breath. The Wildcats took two hard defeats against Minnesota and Purdue last weekend. Northwestern returned from Minneapolis this weekend with no first-place finishes and two Big Ten losses. The Wildcats (4-9, 0-4 Big Ten) suffered losses to both Purdue (5-4, 2-3) and Minnesota (4-3, 4-2) in their last meet of the regular season. Freshman D.J. Hwang said the tough competition made the meet challenging, but the team still performed as best as it could. Though NU could not edge out either team, the Cats had some good performances. NU placed third in the 200-yard medley relay, consisting of senior Nick Peterson, junior Will Hofstadter, junior Arjun Sharma and senior Almog Olshtein. The upperclassmen continued to lead the team in other events. Hofstadter placed fourth in the 100-yard breaststroke, with a time of 55.93, and Olshtein picked up second in the 50 freestyle. Junior Justin Hanson grabbed fourth in the 200 butterfly, with a time of 1:50.30. However, the freshmen did not let the upperclassmen steal the show. Freshman Peter Lewczyk was the fastest NU swimmer in the 200 free, finishing seventh with a time of 1:42.71. Hwang proved himself a powerful force in the distance events this weekend. He finished second in the 1000 free with a time of 9:19.77. Hwang said though he was happy with the race, he wishes to improve on certain areas before swimming the event at Big Tens. However, despite a few impressive swims, the Cats lost by a landslide to both teams. The final scores were 146-50 against Purdue and 144-59 against Minnesota. With the regular season over, Hwang said the team will shift their focus to training for Big Tens in February. The end of the season entails more focus on technique and strategy, Hwang said.